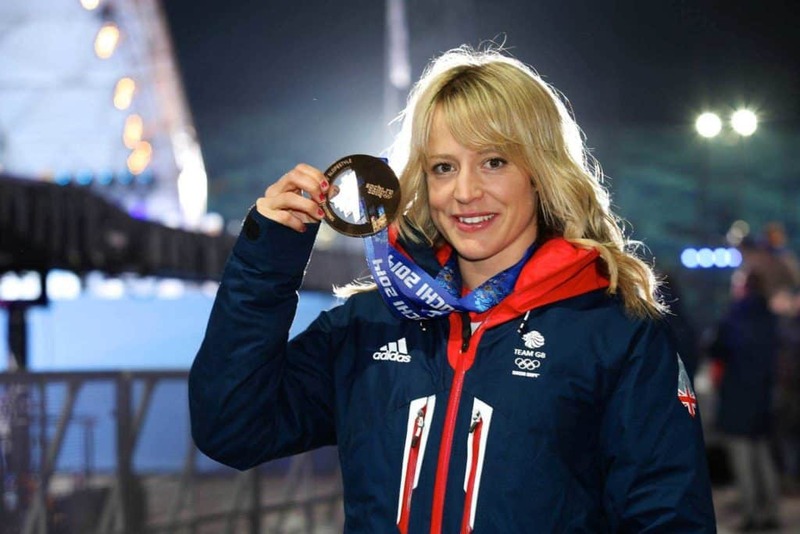 Jenny Jones made history at the 2014 Winter Olympics in Sochi, winning Great Britain’s first EVER medal in a snow event. Taking home a bronze in the women’s slopestyle category, Jenny has become the UK’s most globally respected and successful female snowboarder. A poster girl for Sochi 2014, Jenny became a household name overnight. Jenny first discovered her love of snowboarding aged 17, after having a free 30-minute lesson on a dry ski slope with her brothers in Somerset, close to her hometown of Downend, Bristol. She then went to the Italian Alps on a college trip and decided that she wanted to pursue the sport full time instead of going to University. After finishing her college exams, Jenny headed to France and funded her season by working as a chalet maid in Tignes, riding whenever she could. After entering her first competition in 1999, Jenny set the snowboarding scene alight. After accidentally leaving a teabag in her bra one day, she completed her first back-flip. She kept the leaves from the tea bag for a number of years as they continued to bring her good luck which was highly documented at the 2014 Winter Olympics alongside the touching moment of congratulatory hugs with her mum and dad at the finish line – a surprise to Jenny as she was unaware they had travelled to Russia to cheer her on. Previous to the 2014 Winter Olympics Jenny has entered and won a number of big air and slopestyle competitions – including four Winter X-Games, winning three gold medals in two consecutive years (2009 and 2010) in Aspen and Tignes. Jenny is known for pulling off super technical spins over the biggest of jumps, combining exceptional natural balance with a strong-will to succeed. But while she is feared as a competitor, Jenny is known for her humble attitude and bubbly sense of humour, making her hands down one of the most loved characters on the women’s snowboard circuit. In the summer months Jenny can be found riding waves instead of the slopes as she is also a keen surfer. In 2014 Jenny was announced as the ambassador for the Nissan Juke and shot a visually compelling film snowboarding down a personalised mountain in Verbier for the ‘Personalise Your Thrill’ campaign. As Jenny carves down the mountain she creates her own colourful paths on the slopes, symbolising the thrilling and fun elements you can bring to the trim and bodykit of the Nissan Juke. Jenny is also the ambassador for Pentax cameras capturing every moment along the way of her snowboarding and broadcasting journey. In October 2014 Jenny appeared on hit Sky1HD show A League Of Their Own series 8 on the side of blue team captain Freddie Flintoff. Jenny rode mini-motos with Johnny Vegas and even competed in an upside-down treadmill challenge. As Jenny was such a hit with the team and viewers alike she reunited with the guys again to record two further episodes for series 9 which will air on Sky1HD in 2015. Jenny joined BBC Radio 5Live’s presenting team hosting her own show alongside co-host Will Perry called “Extreme” taking a closer look at the adrenalin-fuelled world of extreme sports. Featuring interviews with some of the sports’ most courageous and charismatic characters, the series also covers the biggest events taking place in the UK and across the world, while giving listeners an insight into what it takes to make it as an extreme sports star. Jenny’s radio debut aired on 23rd October 2014 to rave reviews. This year, a year on from her medal win, Jenny joins the expert team of Channel 4’s winter sports show, The Jump, alongside Graham Bell, Amy Williams and host Davina McCall. Jenny is available for Q&A as well as motivational speaking.